Inline centrifugal fan with the air capacity up to 480 m³/h in steel casing. Supply and exhaust ventilation and air conditioning systems for various premises requiring cost-effective solution and controllable ventilation. EC motors applied in VKM fans reduce energy demand by about 35% and ensure high aerodynamic performance and low noise level. 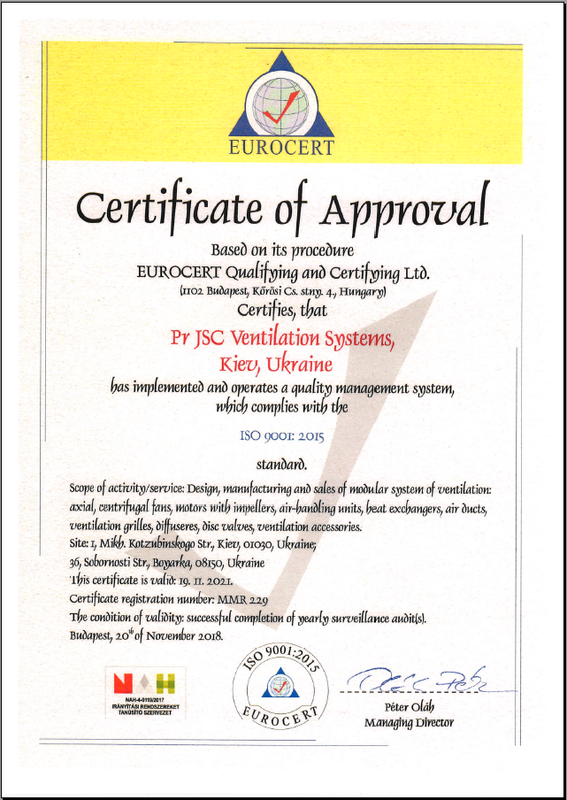 Such characteristics are of special importance for ventilation of public premises as banks, supermarkets, restaurants, hotels, installation close to residential buildings and for domestic application, e.g. ventilation of private pools. EC motors enable integration of several fans into a unified networks and their centralized control. The steel casing ensures reliable operation of the fan in case of its outside installation. The fans are designed for connection to Ø 100, 125, 150, 160, 200, 250 and 315 mm air ducts. The fan casing is made of polymer coated steel. New technologies for manufacture of the fan components let attain the total casing air tightness. The impellers with backward curved blades are powered with a high efficient electronically commutated (EC) direct current motor with external rotor. As of today, such motor type is the most advanced solution for energy saving. EC-motors are featured by high performance and the best speed controllable range. Premium efficiency reaching up to 90% is the absolute advantage of electronically commutated motors. The motors are equipped with ball bearings for longer service life of the fan (40 000 hours). For precise features, safe operation and low noise, each turbine is dynamically balanced while assembly. Motor ingress protection rating IP 44. The fan is controlled with the external control signal 0-10 V (air capacity control as a function of temperature, pressure, smoke conditions and other parameters). Should the control value get changed, the EC-motor adjusts its speed and the fan boosts as much air capacity to the ventilation system as required. Maximum speed of the fan does not depend on the current frequency and it can operate at 50 or 60 Hz mains supply. The fans may be integrated into the unified dispatch system. The respective software enables to control all the fan integrated into the system. The computer display shows all the system parameters. Each fan in the system may be individually adjusted. The fans may be installed at any angle. The fixing brackets that are included into the delivery set are used to facilitate the fan mounting to the wall. The fan is connected to power mains through the external terminal box.